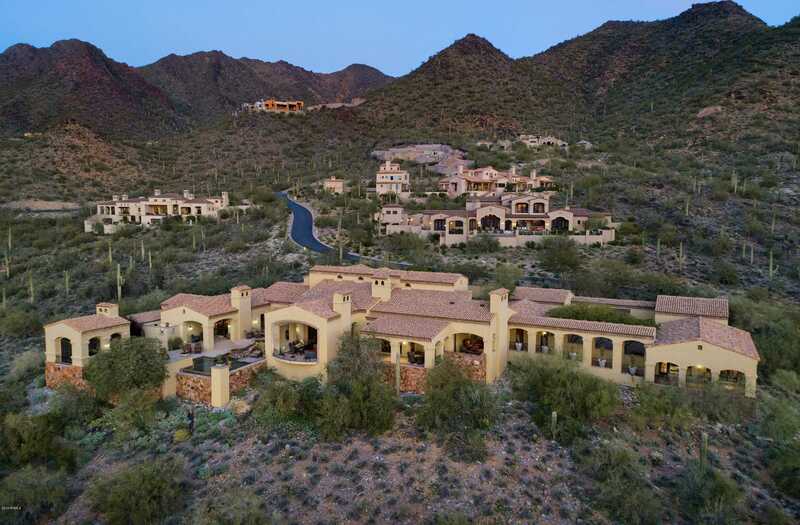 Elegant Masterpiece perched on the mountain side in the Upper Canyon sits on 2 + acres w breathtaking panoramic city light, mountain & sunset views. Entertainer’s delight w a wall of glass doors that open the great room to the outdoor living spaces for abundant entertaining. Intimate private dining room with butlers pantry. Romantic master suite w fireplace on main level w his & her vanities & closets. Upstairs incl 3 guest en suites and library/study. Large two bedroom en-suite guest casita and multiple courtyards. Detached private office w fireplace stunning views. Outdoor amenities incl heated pool & spa, outdoor fireplace, covered BBQ & bar, multiple patios, and pool bath & shower. Finest finishes throughout. This is a must see with the best views in the valley. Furnished. Please, send me more information on this property: MLS# 5855314 – $25,000 – 20880 N 112th Street, Scottsdale, AZ 85255. I would like to schedule a private showing for this property: MLS# 5855314 – $25,000 – 20880 N 112th Street, Scottsdale, AZ 85255.